UreCoat® is een twee-componenten urethaan (A + B) die op een verscheidenheid van oppervlakken kan worden aangebracht en geborsteld om een flexibele, stevige en stootbestendige coating te bieden. UreCoat® bindt veel oppervlakken en kan worden gebruikt als flexibele coating voor uitgebreid polystyreen (EPS-schuim), stof, sommige metalen en kunststoffen, hout, touw (maak wijnstokken voor dierentuinuitstallingen) en meer. Gehard rubber is hard en UV bestand. Gebruik als flexibele verfbasis: UreCoat® is "kleurneutraal" en is makkelijk gekleurd met SO-Strong®, UVO® of Ignite® kleurstoffen om een permanente verf te creëren voor gelakte, gladde urethaanrubbers of flexibele schuimen. volledige uitharding is 16 uur bij 73 ° C / 23 ° C.
UreCoat® bevat geen ftalaten of VOC's. Amount to Mix and Apply at One Time - Because this is a coating, a small amount goes a long way. Mix only what you can comfortably brush on to your target surface in 8 minutes before material sets up. Measuring and Mixing - Before you begin, pre-mix Part B thoroughly to re-disperse components that may have settled. A gram scale is required to accurately measure 100 Parts A to 10 Parts B. After dispensing into a mixing container, mix thoroughly for 2 - 3 minutes using a square edged mixing stick. Aggressively scrape the sides and bottom of the mixing container several times. Use the square edge of the stick to bring material off of the sides of the container and blend. Extending Working Time - Reduce the mass of the mixture to increase working time. Example: layer two sheets of aluminum foil together and create a single-use flat tray with vertical sides to contain the liquid. After mixing parts A and B, pour mixture into the aluminum foil to reduce the mass. Your working time will be significantly increased. Applying - Apply a thin layer to the surface, making sure there are no brush strokes. Wait 30 minutes for material to partially cure and apply a second layer. Subsequent layers can be added as desired. Thinning - To thin UreCoat®, the recommended mix ratio is 100 Parts A + 10 Parts B + 25 or more Parts of mineral spirits depending on the application. Pre-mix solvent into Part A before adding Part B. Observe all safety precautions when handling solvents. Mix thoroughly to a uniform color (no streaks). Spraying UreCoat® is not recommended. 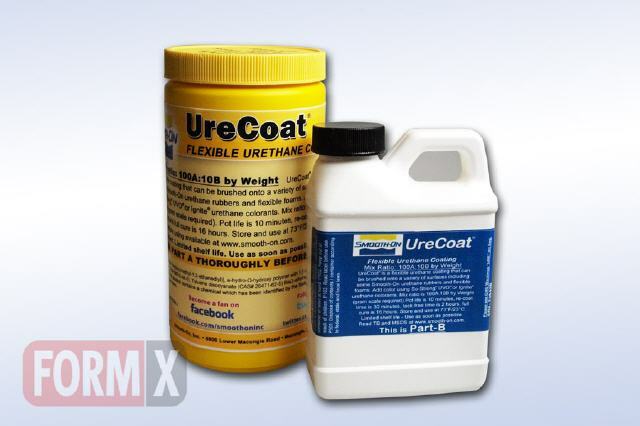 Thickening - UreCoat® can be thickened to a paste-like consistency for brushing or troweling onto surfaces. Ure-Fil® 11 is an effective filler for thickening this material. The recommended maximum filler load when using Ure-Fil® 11 is 100 parts UreCoat® Part A to 10 parts UreCoat® Part B to 15 parts filler by weight. Ensure filler is dry, and pre-mix filler with Part A before combining with Part B. Surface Finish - UreCoat® will cure with a high gloss surface finish. 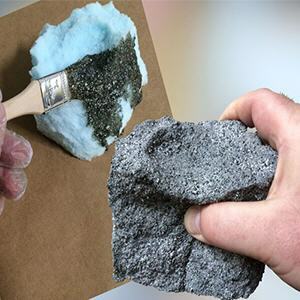 If a matte surface finish is desired, we have two recommended techniques; once UreCoat® gels or partially cures (30 – 60 minutes after applying), lightly wipe surface with a lint-free cloth that will not shed fibers or a lightly brush surface with a soft paint brush. Do not wait until material is fully cured. Another option is to lightly dust the surface of partially cured UreCoat® with powdered sugar. Once UreCoat® is fully cured, the powdered sugar can be washed away with water, leaving a matte surface finish. Curing - Allow UreCoat® to cure overnight (at least 16 hours) at room temperature (73°F/23°C) before handling. Full cure time can be reduced heating the material 150°F/60°C for 4 hours. Allow UreCoat® to come to room temperature before handling. Clean Up - Gently scrape as much uncured material from surface as possible with flat edge tool. Remove remaining uncured UreCoat® with alcohol.